PHOENIX, AZ (January 26, 2016)—Today the Consumer Federation of America (CFA) and the Southwest Center for Economic Integrity (CEI) released a new report titled “Wrong Way: Wrecked by Debt/Auto Title Lending in Arizona.” The report examines the exponential growth of title lenders since Arizona’s law authorizing payday loans expired in 2010 and documents the high risk to borrowers who secure loans with the title to their vehicles, including repossession, deficiency balances, balloon payment debt and collection costs. Under the Arizona Secondary Motor Vehicle Finance Transaction law, lenders are authorized to charge 204 percent for loans of $500 or less, with tiered rates for larger loans to 120 percent for loans over $5,000. These loans are renewed an average of eight times, resulting in $765 in finance charges on a $500 loan for total repayment of $1,265. For larger, longer-term loans, consumers pay thousands of dollars to pay off loans and recover their titles. “Five years after payday lending sunset in Arizona, title lenders saturate our neighborhoods, selling loans at up to 204 percent annual interest. Prop 200 voters in 2008 supported a 36 percent rate cap with no special carve-outs for payday lenders,” stated Representative Debbie McCune Davis. “The Arizona legislature should honor that voter mandate by repealing the triple-digit interest carve-out for title loans and regulating everyone fairly under the Consumer Lender law.” McCune Davis served as chair of the No on Prop 200 committee in 2008. Arizona licensees offer two loans under the title loan law, the traditional loan secured by a clear title as well as “registration” loans made to consumers who do not own their vehicles. Many lenders require borrowers to provide a blank check, debit card or electronic access to their bank account in order to obtain loans, a key feature of the now-expired payday loan regime. 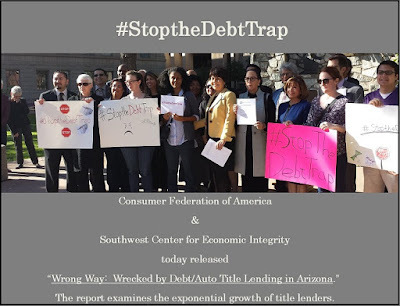 “Consumer advocates warned Arizona regulators that payday lenders would morph into title lenders to keep making triple-digit interest loans,” noted Kelly Griffith, Executive Director of the Southwest Center for Economic Integrity based in Tucson. “Sure enough, title lenders are making registration loans with rates and terms very similar to payday loans that voters thought had been removed from their neighborhoods,” Griffith added. · In mid-2015, one hundred companies were licensed by the Arizona Department of Financial Institutions to make title loans at 633 locations, a 300 percent increase in less than a decade. There are more title lender locations than there were payday lenders when payday lending in Arizona was outlawed in 2010. · Twenty companies with almost half the licensed title loan locations also offer “registration” loans at the same rates as title-secured loans. These loans are similar to payday loans. · If Arizona is typical of the other 24 states where title lending is legal, 190,000 to 285,000 consumers took out title loans last year. If Arizona is similar to Virginia, a state that collects data on licensees, title lenders took in $316.5 million in revenue last year. · Title loans are asset-based lending, based on the lender’s ability to collect rather than the borrower’s ability to repay the loan while meeting other obligations. Lenders tout “No Credit, No Problem,” and many do not conduct credit checks. · Risks to title loan borrowers include repossession of vehicles, deficiency judgments when sale of repossessed property does not cover the amount owed plus costs, and lawsuits when borrowers default and lenders sue. If Arizona repossession rates are similar to those reported by Virginia regulators, it is likely that 25,320 borrowers lost their vehicles to repossession last year, based on 633 locations. · Repeal of the Secondary Motor Vehicle Finance Transaction law and regulation of all lenders under the Consumer Lender law including the 36 percent annual interest rate cap and stronger supervision and protections. · Strong payday and car title loan rules by the Consumer Financial Protection Bureau to require ability-to-repay determination for the first and every loan made by title lenders. · Investigation and enforcement of state and federal laws by the Arizona Attorney General, the Arizona Department of Financial Institutions, CFPB and the Federal Trade Commission.